Tropical interior design looks better than it sounds. If you wanted to turn the Amazon into a living room, these are the design ideas and tips to follow. Let's start from the walls: a slightly over the edge wallpaper, like the Merian Palm by Timorous Beasies, on a main feature wall will instantly give the tropical feeling to the room. It can be paired and balanced by a deep colour paint for the remaining walls and a classy light shade, like the one from Tom Dixon. A main feature wood coffee table will add the unique touch, together with the stunning Cube Terranium by West Elm to bring life to the room, literally! Make yourself a coffee, grab your favourite mug, magazine and blanket and sink in our Helena Scatterback in Wool Linen Mix, Olive. 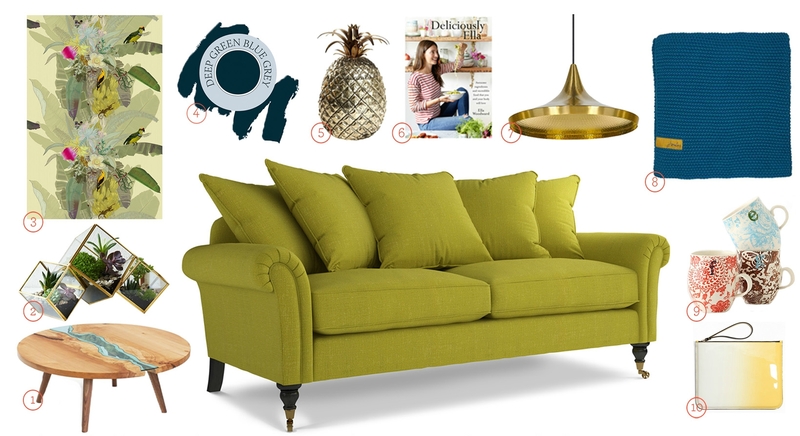 This eccentric, elegant and unique sofa brings a tropical storm to your home thanks to its vibrant green colour. Helena is a classic queen sitter, making it the perfect centre piece for your tropical inspired room. Pair with accent pieces made from mixed materials and a good healthy living cook book curtesy of Deliciously Ella to add some quirkiness and interest to the room. Design Tip: Look to mixed materials for your accent pieces to add interest to your room.